The Heritage Resort and the PGA in Ireland this week were delighted to reveal details of an exciting relationship with the Seve Ballesteros Foundation in 2016. 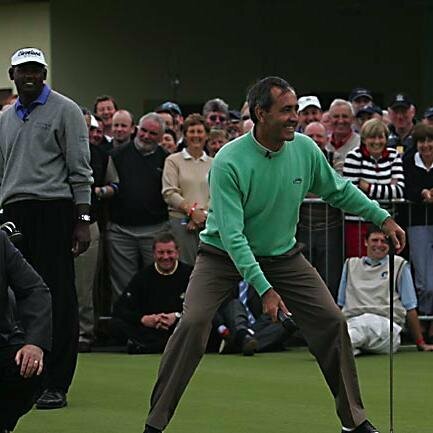 The sixth annual Heritage Challenge Pro-Am, which will take place on Saturday 4th & Sunday 5th June 2016, was already one of the highlights of the PGA in Ireland calendar and will now feature an increased prize fund of €50,000 and will support the charitable efforts of the Seve Ballesteros Foundation. A Gala Dinner and Charity Auction in aid of the Seve Ballesteros Foundation will take place at the conclusion of play on Sunday, June 5th. Items donated thus far for auction include a fourball at Royal Pedrena Golf Club, a visit to the Seve trophy room in Seve’s house and a sculpture of Seve’s grip – all money can’t buy items. PGA in Ireland secretary, Michael McCumiskey said; “Support for golf and playing the game has recovered in recent times and, as part of that, we look forward with great enthusiasm to the staging of The Heritage Challenge in aid of the Seve Ballesteros Foundation“. The Heritage Resort is closely associated with the Spanish golfing legend as home to the Ballesteros Course, the only golf course in Ireland designed by the legendary five time major winner. The venue is consistently ranked among the top 10 parkland courses in the country by Golf Digest magazine and has previously hosted The Seve Trophy and Irish Senior Open. Last year’s tournament was won by David Higgins (Waterville) who carded rounds of 68/75 to edge out Colm Moriarty (Drive Golf Performance) with Daragh Lernihan (Elm Park) back in 3rd place. Entry for a team of 3 costs just €1,000 and includes a donation to The Ballesteros Foundation, 2 rounds of Golf with a top PGA professional, on-course refreshments each day, barbeque on Saturday 4th June and Gala Dinner on Sunday 5th June, special accommodation rates at partner hotels and a memento of the occasion. Places are limited, so to guarantee a place at this year’s event contact Dean Redmond on 057 8642321 or email info@heritageresort.ie.